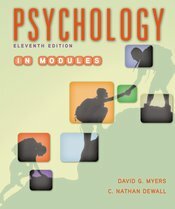 In this version of Psychology, Eleventh Edition, David Myers and Nathan DeWall break down the new edition's 16 chapters into 55 modules, assignable in any sequence and brief enough to be read in one sitting. It’s a format favored by a wide range of students and instructors, one that’s supported by substantial research showing that shorter reading assignments are more easily absorbed than longer ones. The new edition of Modules includes the same new features and content of Psychology, Eleventh Edition, and like that text, is more than ever a fully integrated text/media learning package. New features (How Would You Know; Assess Your Strengths) move students from reading the chapter to actively learning online. Those features and more are included in the book’s dedicated version of Worth Publishers’ breakthrough online course space, LaunchPad, which brings together a fully integrated e-Book, LearningCurve adaptive quizzing, a rich collection of student media resources, and easy setup, assessment, and course management options for instructors.